My Central Valley – The Central Valley’s Source For Quality Television & Local Programming! The Central Valley’s Exclusive MyNetworkTV Affiliate. MyCV is your source for quality TV brought to you by MyNetworkTV, as well as local programming and the home of the San Francisco Giants! The easiest decision you’ll make all day. Light TV brings America’s most beloved and iconic television series, hit movies and original programming to the Central Valley. MyCentralValley (AKA MyCV) is the Central Valley’s Source for quality television and local programming, and the home of MyCV, Light TV, ION TV and H&I Central Valley. Our coverage includes the following counties: Fresno, Madera, Mariposa, Merced, Kings and Tulare. The Central Valley’s Source For Quality Television & Local Programming! 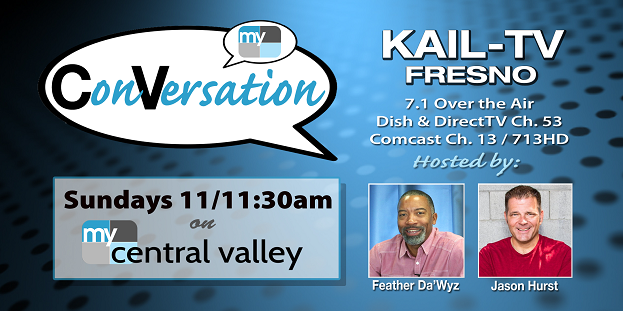 Join local personalities as they have real conversations with those who influence our Central Valley Lifestyle. Are you a local business? Advertise where it counts! 95% of US homes have at least 1 TV, and advertising on local television saves you money with a higher ROI. Don't wait to be seen by your local community, get started today!